Welcome learners, lets us proceed further with the information we already have. In this post we will explore more about finding hacked accounts online. 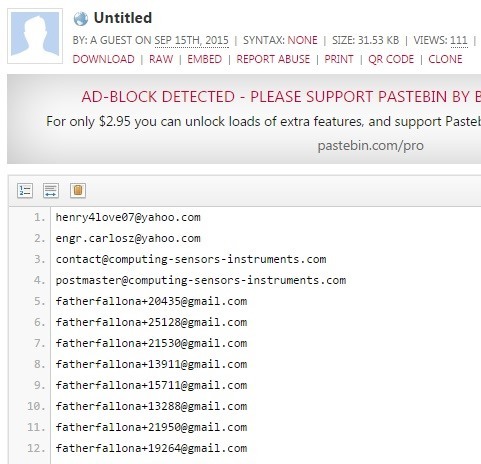 We will look into how to find juicy info in pastes which are deleted on Pastebin. While accessing some of the links from haveibeenpawned you might notice that the linked page no longer exists on pastebin. Instead you'll just get a message 'This Paste was removed' OR 'this is a private paste'. Let's follow through how to still access the hidden data that is out there. Google Is There for Help! So you have reached a deleted page. Now think why the page was deleted? Maybe there is something really juicy in there which they did not want the world to see. Yes, we got the boost we need. Let's use google to help us retrieve the page contents that were deleted. Google robots/spiders keep tracking each and every page on the internet and chances are they already have cached data when the page was accessible. To get the details, simply add cache: before the URL in address bar and press enter. Voila, you now have access to the page that was deleted. Now when you reach a deleted page, just click the bookmarklet and you'll automatically be redirected to the cached version of the page. You can use this bookmarklet to view any cached pages and not just pastebin ones. This trick only works if google has cached the page before it went private or was deleted. So I don't know if this is really usefull. Most pastes go on private right away but maybe you can recover some deleted pastes. Well that is true, but this works for me 90% of the time, I rarely seen 404 on google caches. Does "window.location.href" go wrong on that page? And thanks for your sharing. Thanks for the praise! I never encountered this issue myself. I wrote that myself, here is one other version I found online, https://ostermiller.org/bookmarklets/cache.html Hope this helps. Thanks for improving this, much appreciated! anything deleted from pastebin will be present on psbdmp, dumpmon, etc.